Welcome to the perfect place for your next Florida dream vacation! This exquisitely kept property with a large and stunningly beautiful backyard is not only an inspiring oasis for relaxation, it also gives you immediate access to the water from your own, private boat slip. Feel like chilling at home instead? How about taking a dip in your private, refreshing pool then, with some lounging in the sun afterwards? No matter what you feel like doing, you’ve come to the right place. 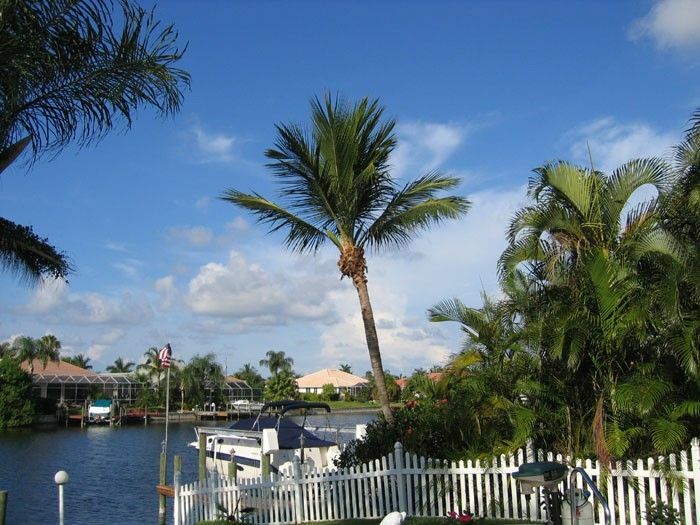 Perfectly benefiting from its southern exposure, our villa is located in one of Cape Coral’s most desirable neighborhoods, offering almost 2500 square feet of luxurious living space. Kick back in the home’s covered Lanai, barbeque a delicious meal “cool by the pool”, or take advantage of our available boat rental (ask about special offers for our guests) to explore the crystal clear waters of the Gulf of Mexico. However you choose to spend your days, the most difficult thing will be having to leave from here again once it’s time to go back home. Leave the stress at home. Forget the boss. Breathe. Live! Upon your arrival, you will immediately appreciate the area’s low traffic. Even the main arteries have one lane only, thus greatly slowing down the overall traffic flow. Also, unlike many other local vacation rentals that were designed to be “maintenance friendly” and could easily be mistaken for a helipad with their bleak concrete backyards, the European owners of this villa take great pride in their tropical paradise. It is meticulously maintained and features lush green lawns and exotic (fruit) trees as well as other attractive, gorgeously landscaped plants. The home’s stunning, private pool area is not enclosed and offers a true “al fresco” experience. Don’t like getting eaten alive by mosquitos and other critters while you’re enjoying the backyard? No problem, as the owners invested in a sophisticated “Mosquito Magnet” pest control-system that allows you to take full advantage of everything Florida is famous for: Comfortable temperatures and sunshine year round, spectacular sunsets, crystal clear, warm waters, undisturbed nature, and a stress free environment from the minute you arrive. It’s outdoor living at its best. Inside, the house fittingly conveys an airy, “beachy” feel and easily accommodates up to six adults, who will immediately feel at home in the property’s two separate living rooms and its generous master suite, which has another, separate bathroom. Of course this contemporary villa offers all the amenities you could possibly expect or want, including washer and dryer, modern kitchen appliances, hot tub, outdoor shower and BBQ, flat-screen, cable TV, fast WiFi and central AC, to name just a few. Yet, as tempting as it may be to just hang out at home, don’t forget to also explore Cape Coral’s critically acclaimed food scene, which offers cuisines for every taste and budget: Restaurants, Cafés, Clubs and stores are nearby and can be easily reached. So treat yourself to some new culinary experiences and a night in town. Moreover, if you would like to rent a boat during your stay, so you can truly take advantage of this home’s prime location, we will be happy to make all the necessary arrangements as a courtesy. We are not asking for a commission and will be glad to set everything up so you can immediately do what you came here for: Take a breather, explore and enjoy. Several boats of different sizes are available to choose from, as are daily or weekly rentals (starting at $ 500 per week). Needless to say, all boats are properly insured and will be personally delivered to you. A thorough, personal introduction is provided at that time, guaranteeing safe operation. If interested, please contact us so we can provide more details and address any questions you may have. As you can tell, we simply want you to have a wonderful time while you are staying here. This luxurious suburb of Fort Myers is cris-crossed by 600 km of canals. Dreamy pirate islands are located just out the door. Not only sports boat pilots will enjoy it here.